This is a parallel hybrid scooter mounting an electric motor and gasoline engine. 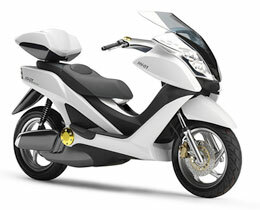 Despite the large body that gives a feeling of spacious comfort to the ride, this model has torque-y power development in the low rpm range that delivers the acceleration feeling of a bike one class above, as well as good fuel economy, environmental friendliness and performance that brings a real joy of riding. The frame is a CF aluminum die-cast type. At the same time it has convenient functions that only a hybrid bike can offer, such as a "quiet mode" (running only on the electric motor) and a "push mode" that makes pushing the bike in places like parking lots easy (super low-power drive when off the bike). Fuel cell systems using hydrogen gas as their fuel are the most common, but it is difficult to make a compact system of this type. The "Yamaha Direct Methanol Fuel Cell (DMFC) System" uses a liquid methanol-water solution as its fuel, which eliminates the need for a converter and a pressurized (fuel) tank and thus makes it possible to create a lightweight system for a small vehicle requiring power in the 1 kW range without compromising on power output characteristics. Based on survey data gathered from licensed public-road use of our "FC06 PROTO," a prototype mounting the Yamaha DMFC system, the advanced fuel cell motorcycle model "FC-me" has now been created with improved performance in areas like reliability and running distance. 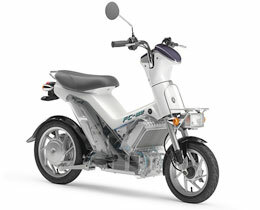 By optimizing the control parameters for the fuel cell system, Yamaha's engineers have achieved an energy conversion rate for the FC-me that is 1.5 times that of the FC06 PROTO, while re-evaluation of the body components has made possible a light machine weight of just 69 kg. A contract has been signed with Shizuoka Prefecture to put this model in practical use on a lease basis as of September 16 of this year.